Blackhawk Legacy L-6V Night Ops Tactical Flashlight, 570 Lumens, 6″ Body. 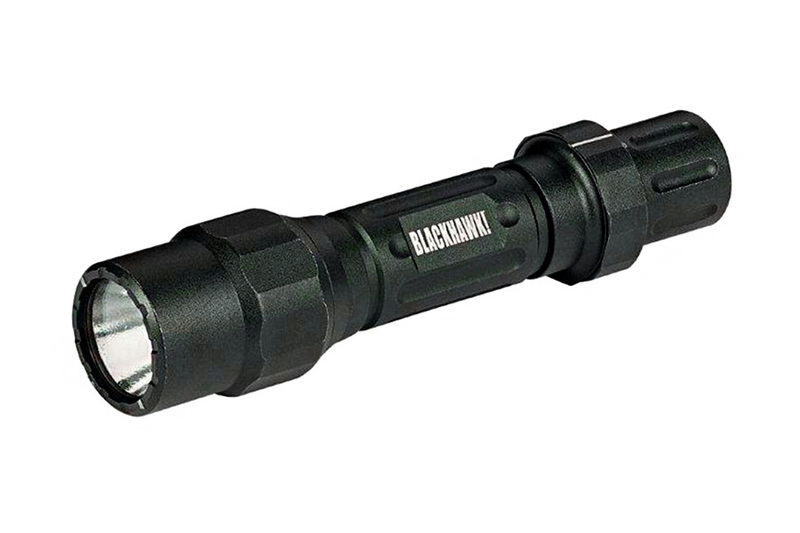 Blackhawk Legacy L-6V Night Ops Tactical flashlight. Features aluminum body, dark green anodizing, high output CREE XM-L LED bulb, 1″ body for weapon mounts, tempered glass lens, multi-position rotating switch for high, medium, low, strobe, off settings, with a momentary/constant push button rear switch. High=570 Lumens, med=220, low=20, strobe=max. Runs on two CR123 battery (included). Rated for 1m drop resistance, and 1m water submersion. Superior performance, esp. with the on-sale price. Make fine stocking stuffers. I bought 2 for $65 shipped ($25 each and shipping). The light is outstanding, however not perfect and a bit pricey. Not easy to find a pouch for it, and no lanyard, and cannot stand up on the tail due to the switch not being recessed. The bright setting is excellent and lights my whole 1/4 acre back yard very well. The light brightness levels and settings are diverse and excellent and strobe is BLINDING so if you need a blindingly bright or strobe light, this is excellent. I don't like the dial switch but that's a small point.